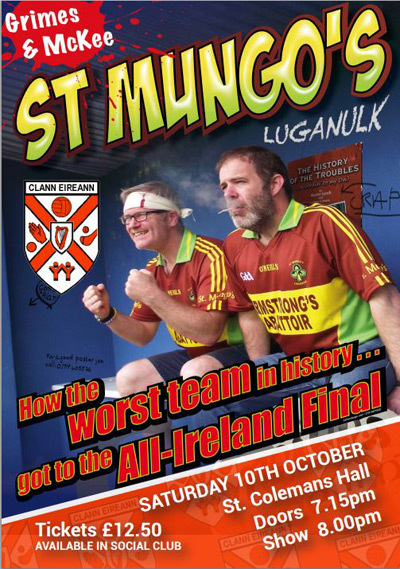 On Saturday 10th October, Clann Eireann will host the hilarious comedy “ST MUNGOS” for all you GAA Lovers. The production, was written by and starring the irrepressible Conor Grimes and his side-kick Alan McKee. A story of how the worst team in Ireland ended up in the All-Ireland Final. Rooted to the bottom of Division 4, without a win in six and a half years, St Mungo’s GAC are officially the worst Gaelic Football team in Ireland. Nobody’s buying the weekly lotto tickets, nobody’s coming to the games anymore, and it’s getting harder and harder to find fifteen able-bodied men to pull on a jersey and represent their parish. When they’re drawn against their near neighbours and vicious rivals the whole village expects yet another first round exit, and perhaps the end of Luganulk, but the footballing gods intervene and St Mungo’s fluke a one point win, in the ninth minute of injury time. So begins an impossible journey around the B-roads and hamlets of Ireland; their resolve tested by mountainy savages, midges and endless platters of tray-bakes and sandwiches. Based on a true-ishstory. Come and see how the good people of Luganulk learned to love their football team again. A night not to be missed – your support would be greatly appreciated. Tickets £12.50 available in Social Club or from Committee members.